Itty Bitty Hill: ATTENTION! Last Call for March 2010 Shirts - and More Details! ATTENTION! Last Call for March 2010 Shirts - and More Details! Design: fabulous and by Dianne Beard Vallier. Picture reposted again below. Don't you love it?! Color: indigo/periwinkle-ish color so that's it's in the neighborhood of the March of Dimes color with some extra blue in it. It's pretty and will look gorgeous on men, too - especially if they have blue eyes like SuperDad. Price: $12 each, with an extra $1 if you need XXL or more X's. Roughly half of that price will go to the March of Dimes, and I can provide you a tax-deductible receipt for that half (I believe). Shipping: If you aren't local (in the metropolitan Nashville area (or Bethpage) or someone that I will see soon, it looks like shipping is going to be $2.50 per shirt. That's the actual shipping cost. If it turns out that it's less to your particular zip code (or because you are ordering kids' shirts which weigh less), I'll happily credit you the difference. Leave a comment with the quantity and sizes AND your e-mail address. E-mail me directly at SpeasHill(a)gmail.com, again with quantity and sizes, along with your mailing address. Send me a facebook message, again with quantity and sizes, along with your mailing address. Thanks so much for all the interest you guys have had in these shirts! I think they are going to be great and will hopefully push our team past our fundraising goal. By the way, our team's goal is $1,000, and despite what the widget in the sidebar says, we are nearly 3/4 of the way there, with $730 in donations so far! 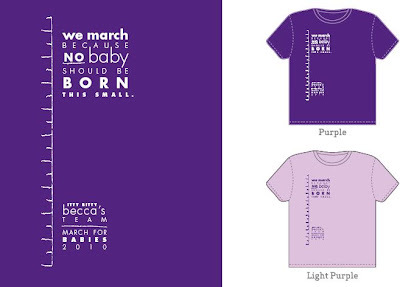 And don't forget that if you don't want a t-shirt or would like to donate in addition to your t-shirt purchase, you can donate directly through my website, www.marchforbabies.org/BeccaHill! Every penny counts, so don't be shy about donating a lot or a little - if every follower of this blog donated $5, that would be over $200 right there! Wow! You can also sign up to walk with us on the website! And here's the design again, one more time...just picture it on a blue-er shirt, in a brightness kind of in between the two colors shown here. Matt and I will take an adult S and adult L.
I keep meaning to blog about the walk and get sponsors toward our family goal. I will definitely do that before the walk! I want at least one: if they're womens' sizes, I'd like a Medium. If they're mens' sizes, a small please. I'll let you know tomorrow if I want a childs' size S, too. I want one. An XXL please. I can mail you the check this week.